When and why did you found the Global Penguin Society – what inspired you? When I was a small boy, my grandmother used to tell me fantastic stories of when she used to visit penguin colonies at the beginning of the 20th century. She used to go with horses and wagons to the coasts of Patagonia. There was no such a thing as eco-tourism at the time, and in those same regions they were killing sea lions, elephant seals, and killing and boiling penguins to make oil. My grandmother’s stories were her legacy to me. Then at 19 years of age, I went to visit a colony of penguins for the first time and I felt an incredible emotional connection with them. I realised that protecting them would be my mission in life. At the time, in the Argentinian Patagonia, 40,000 penguins were dying every year due to pollution caused by oil spills. It was so common to see them dying on beaches that local people got used to it. In 1991, there was a massive oil spill and 17,000 penguins died in two months. With a group of friends, we set up a rehabilitation centre. We managed to attract the attention of the media and that increased the visibility of the problem. I realised then that I needed formal training if I was to really help, so I went to University to become a better conservationist. I obtained my degree in Biology and then my PhD. I have been a researcher at the National Research Council of Argentina since 1998. But about a decade ago I realised there was a need to capitalize on all the great science around penguins and use it to develop conservation projects. So I founded the Global Penguin Society, an international organisation that promotes the protection of all the penguin species on the planet and their habitats. We work in three areas: Science, Management & Creation of Protected areas, and Education. In 2019, we will celebrate GPS 10th Anniversary year and we are so thrilled about the impact that we have been able to have in conservation. What is so special about penguins? Penguins are Southern Hemisphere seabirds. They are athletic, interesting, and ancient. A breeding Magellanic penguin often covers 10,000 miles a year, which is about the average distance a car is driven in the UK. Emperor penguins breed in Antarctica where they keep their egg warm by holding it on their feet while enduring temperatures as cold as -30 to -40°C with the wind blowing 40m/s, about 90 miles/hr. Humans couldn’t survive for long in those conditions. Penguins are remarkable creatures. They vary in size from the Little Blue penguin that weighs just over 2lbs and is a shallow diver, to the Emperor penguin that weighs 80lbs and can dive 500m and hold its breathe for 23 minutes. In contrast, the record dive for a human is 101m in 4.13 minutes. Penguin species live from the tropics in the Galapagos to frozen Antarctica and across islands and continents in the Southern Hemisphere. They all are black and white, and some have yellow and orange crests or are bluish in coloration. Some individuals in the wild live more than 30 years. They nest in deserts, in forests, on bare rock, in burrows, under bushes, under trees, and in the open. 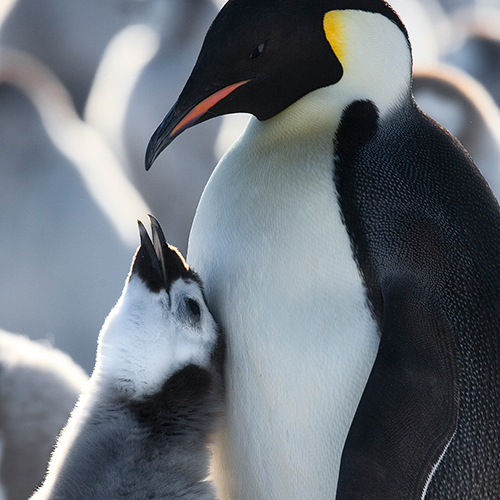 Even though penguins live in remote areas of the world, humans have a big impact on them. Early Antarctic explorers depended on them for food, businessmen harvested tens of thousands of them for their oil, and earlier settlers to islands ate them and collected their eggs. Now, penguins are among the most endangered groups of seabirds. Over half of the penguin species are listed as threatened on the International Union for the Conservation of Nature (IUCN) Red List. Penguins are environmental sentinels. People love penguins but are unaware of their decline. Their natural charisma makes them the perfect ambassadors for our ocean and coastal health. 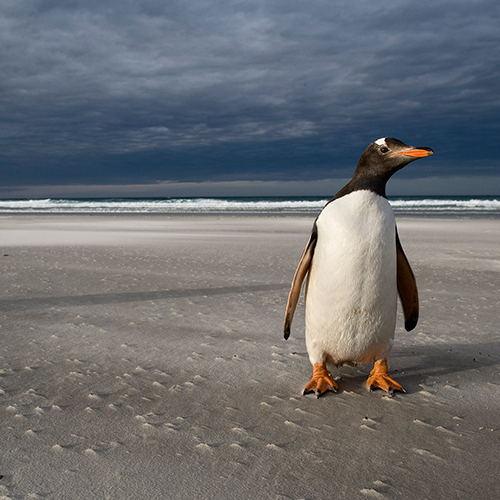 Do all penguins live in icy environments, or are they also found in hotter countries? Actually, from the 18 species of penguins, only 4-5 live in areas with very cold temperatures. The issue is that most movies and documentaries about penguins are focused on Antarctic penguins; but they are also found in places like Peru, Galapagos, Chile, Argentina, South Africa, Namibia, New Zealand and Australia. The penguins here in Patagonia, when winter comes they head to Brazil. Some penguins are tropical like the Galapagos penguins that nest in lava caves, others live in the deserts of Peru surrounded by cactus, like the Humboldt penguins, or nest in burrows in semi-desert areas like the Atlantic coast of Patagonia. And the most surprising thing is that some live in very dense forests, like the Fiordland penguins that breed in New Zealand. Are you working in the UK in any way? We work in UK in many different ways: we have institutions and individuals that have been supporting our projects for almost two decades now. We work with many colleagues from research centres and academic institutions when we conduct scientific projects. We also partner and interact with institutions that work in wildlife conservation. Through the Whitley Fund For Nature Awards that we have received, we have had the chance to meet in several occasions with Her Royal Highness Princess Anne and also with Sir David Attenborough. In their roles they have a tremendous impact on wildlife conservation globally. How many penguin colonies have been, or are being, researched and how is the work of the Global Penguin Society helping to protect them? Have you had any notable successes? The Global Penguin Society (GPS) is an international organisation dedicated to the conservation of the world´s penguin species, the coasts and the oceans they inhabit. 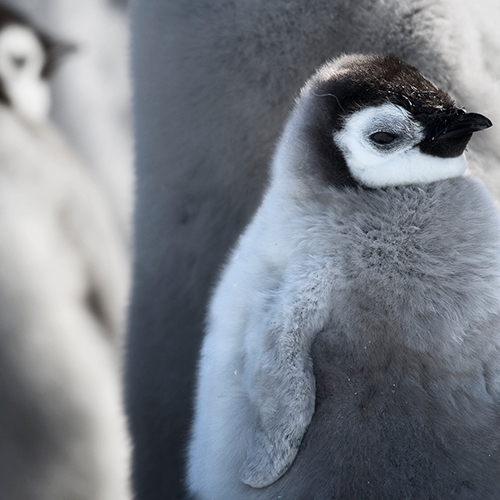 Through science, creation and management of protected areas, and education projects, we address the threats at small scale when penguins nest, and also at larger scales when they swim hundreds and thousands of kilometres to feed and migrate. In terms of Science, GPS improves scientific knowledge on critical aspects of the biology and ecology of penguin species in order to guide conservation work. We conduct our own projects, work in collaboration with partners and support other species projects worldwide. Currently, our main research work is focused on penguins in Patagonia Argentina, New Zealand, Chile, South Africa and Antarctica. As regards Education, to foster a “conservation culture” is our educational goal. By raising awareness about penguins, we both involve and empower local communities and reach decision makers. Finally, in terms of Management-Policy Making, GPS works closely with government, community officials and landowners to create effective conservation policies to benefit not only penguins, but their entire local ecosystems and nearby communities. We are very proud of our accomplishments, as so far we have been able to benefit 1.2 million penguins, secured the protection of over 8 million acres of habitat for penguins, and reached thousands of kids with our education programme, inspiring a conservation culture. Our seas are under threat now as never before in human history. Penguins can increase awareness of ocean health, making us reconsider our policies and behaviours. As charismatic sea creatures, penguins can foster public and political support for integrated ocean conservation, helping to protect vast environments and thousands of other species. Among other activities, GPS promotes the generation of science-based conservation, assesses the status of penguin populations, educates and advises governments and communities, influences policies, and campaigns through the media to educate people on how to improve penguins’ quality of life. How much of a problem is plastic pollution for our penguins and our oceans, what impact on marine life are you are seeing? We have a plastic culture and now we’re addicted to plastic. A long time ago we fell in love with single-use plastics and did not worry about the consequences. Pollution is a critical issue now. Every year, nine million tons of plastic ends up in the ocean, and there it can be lethal. 700 marine species have been reported to have eaten or been entangled in plastics. There are reports of some species of penguins trying to eat plastics when feeding in the ocean. We ourselves have found penguins almost strangled with the handle of plastic bags and in one case we found one penguin with a plastic bottle around its neck. It is not unusual to find different kinds of plastics in their nests. One of our campaigns is called “Cleaning the House of the Penguins”. Every year, before penguins arrive from their annual winter migration, we take adolescents to collect garbage and debris from the beach and nesting areas. Materials are then processed at a recycling center. Much of this is plastic, making this a good opportunity to draw attention to the problem of single-use plastics and ocean pollution. What can we do in the UK to help? Every single one of us can play a part by making small changes to our daily lives. Make sure that your food, your clothes and all the products that you use have a sustainable origin and destination. Recycle as much as you can and avoid single-use plastics. It is also very important to stay connected to wild areas and wildlife. Teach your children and your friends and colleagues to love and respect nature. That will increase their quality of life and also will make them understand the need to protect the environment to secure a healthy life, mentally and physically. Is it important to you personally to use natural and organic products, and buy from brands that have sustainability at the heart of their business? Absolutely! Maybe due to my scientific background, I like to read and be informed in order to make educated decisions. And when doing so you become aware of all the harmful practices and consumptions that we can avoid. In developed countries this is easier as there are more sustainable choices available. For example, in developing countries, clean energies are not always affordable so they are not an option. And the same thing applies to different products. But I believe that, as customers, we have to invest and put our money where our mouth is. Do you have a favourite species of penguin? I love them all! But honestly, I really like crested penguins, with those colourful yellow and orange crests and their red eyes. They look so fantastic to me. For some reason I feel one particular penguin species that is special is the Yellow-eyed penguin. They are a sacred species to the Maori community in New Zealand. There are only 1,700 pairs left on the planet. I think they are magnificent and mystic. What is the best thing about working with penguins? The best part of my job is to be among them in their colonies. There is a unique and very special energy there. Every time I have to make a difficult decision, I feel the need to visit them and it helps me to clear my mind and always make the right decisions. They connect me with something that allows me to expand my vision of things, my perspective, and help me to think big. I owe penguins a lot because I met my wife thanks to penguins. I visited a remote island in Patagonia to census a colony and I met Laura who was working on sea lions on that same island. I cannot imagine a planet without penguins, they enrich our existence. Photographs provided by J Weller Copyright © All rights reserved.